The Zetronix zBlackBox-HD3 dash camera comes equipped with the highest-quality 2.7K resolution video sensor available. The product gives you the best possible video with sound via 2.7K and WDR technology.The zBlackBox-HD3 includes built-in WDR (Wide Dynamic Range) technology that records excellent scene details from shadows and highlights. This aspect of the camera allows it to capture extremely detailed video during the day or night. This product also includes a large 2.4” LCD screen with an HDMI out. This makes it possible to see what you record live on the screen. You can also play back your videos on a TV, monitor, or computer. This dash cam’s built-in battery can be charged with a car’s cigarette lighter. It works while it’s charging, and it also works wireless for as many as 40minutes. 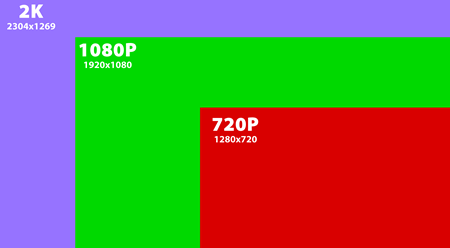 Full 2.7K video resolution 2304 x 1269p is 30 percent more pixels than 1080P WOW! Full 2.7K HD Resolution Video Sensor OVER 30% Higher than 1080p! The zBlackBox-HD3 comes equipped with a 2304 x 1269 resolution 2.7K sensor. That means the dash cam records images at over 30 percent more pixels than the more-standard 1080p. As a result, this dash cam can capture a crystal-clear image of a license plate from a significant distance. The zBlackBox-HD3 records images with a clarity that’s unmatched in the market, and with a ultra-wide 160-degree lens, not a single detail will be missed. If you worry about vandals or thieves taking liberties with your car or truck, the zBlackBox-HD3’s motion sensor detection makes it ideal for surveillance. All you have to do is set the device to motion detection and leave it plugged into your cigarette lighter, or leave it running on wireless battery power. When someone approaches your vehicle, the unit records that individual’s face and every move he or she makes while near your property. If you don’t want to worry about the dash cam’s battery power running out while you’re away, the optional Hard Wire Dash Cam Kit allows you to spy on vandals without fretting over a power outage. The zBlackBox-HD3 is compatible with up to a 128GB Micro SD card (Class 10+) that can store and record up to 34.2 hours of HD 720P video on a 128GB Card. Note that the Micro SD Memory Card is NOT INCLUDED. The first time you use your zBlackBox-HD3, simply adjusts the date and time to your current location. Once that’s done, all your videos and photos will have a date and time stamp superimposed in the bottom right corner. The zBlackBox-HD3 comes equipped with an HDMI output as well as a RCA AV Out, which enables you to plug your dash cam into your TV, or watch your videos on any other device with an HDMI or an AV output. Your safety will never be compromised by an obscured view, thanks to the zBlackBox-HD3’s compact size. This product complies with all US and International safety laws. 2.3" X 2.0" X 2.4"